Our REAL Garlic Mashed Potatoes are creamy and full of delicious flavor. Surprising simple, using no oil, butter, margarine or milk. 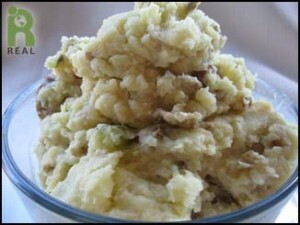 If you buy or make a rich vegan vegetable stock (see recipe), you will not need salt and pepper in these mashed potatoes. Also, the celery in the boiling potato water adds a natural salty taste to the potatoes. That being said, if after you have made the potatoes and you feel they still need a little more salt and pepper, by all means, use to taste. Take four large bulbs of garlic and slice the top off (about a 1/4 inch from the top) just enough to expose all of the cloves. Don’t cut off too much of the tops of the bulb. Place the garlic in a heavy baking dish and ladle about a cup of vegetable stock over the garlic bulbs, sprinkle with chopped organic Italian flat leaf parsley, make tight seal by covering with baker’s parchment paper or in a shallow roasting pan that has a lid. Place the garlic in a hot oven (about 375 degrees) for about an hour or until the garlic bulbs are a dark golden brown, and the garlic can be easily squeezed out of the bulb with your fingers. WARNING: let the garlic cool to the touch before squeezing it. When the garlic is cooled, squeeze into a medium sized mixing bowl and add one cup of vegetable stock or cashew cream or half stock and half cashew cream. Puree the garlic and stock/cashew cream mixture and set aside to be used later in the mashed potatoes. Bring a large stock pot of water (about a gallon) with the celery and the potatoes with the skin on cut in to quarters and simmer at low heat until they can be pierced gently with a fork. Immediately drain the water and let the potatoes “dry” in the pot they cooked in with lid removed (about a half hour). Once the potatoes are free from water (dried), place them in a large mixing bowl and mash with a potato masher. Add the garlic mixture and mix thoroughly. Remove the potatoes to an over proof serving bowl and place (covered) in a warm oven (around 250 degrees) for at least a half hour (or until they are thoroughly heated) until you are ready to serve. The potatoes will keep nicely (in the refrigerator for about three days or in the freezer for up to two weeks) if you make them ahead of time. Just make sure you store them in an airtight container, reheat and serve. Watch our Food Show on making Garlic Mashed Potatoes in our series on Seitan Picatta With Garlic Mashed Potatoes.